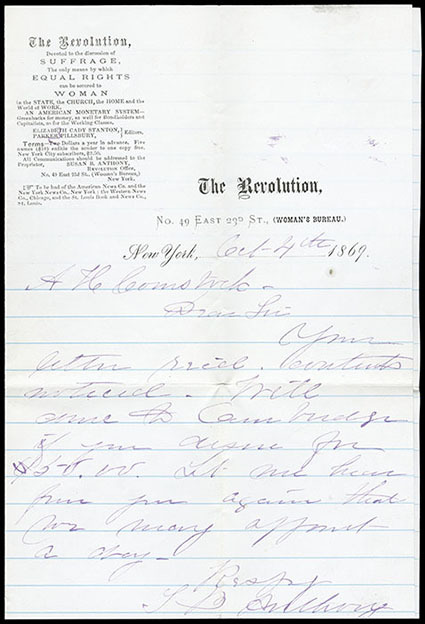 Susan B. Anthony, ALS, 1pp, dated October 4, 1869 on stationery of The Revolution, "Devoted to the discussion of Suffrage" and written to A.H. Comstock: "Your letter rec'd. contents noticed. Will come to Cambridge if you desire for $50.00. Let me hear from you again that we may appoint a day - Respy, S. B. Anthony", accompanied by original orange cover bearing 3¢ ultramarine (114) tied by "New York N.Y., Oct 4" duplex to Cambridge N.Y., fresh and Very Fine letter. John Hancock, Signer of Declaration of Independence, Delegate from Massachusetts. 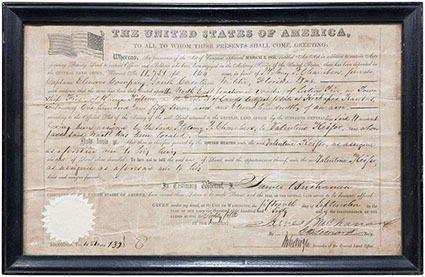 ALS as President of the Continental Congress on single page holograph letter headed "In Congress Octr. 1t. 1776" and reading "Whereas a full Representation in Congress of the several United States is highly necessary on Business of much importance to America, therefore Resolved, that the President be denied to write letters to the Conventions and Assemblies of the respective States, requesting that Measures be taken to cause a speedily as possible a full Representation of the States in Congress. By order of Congress, John Hancock Presidt. 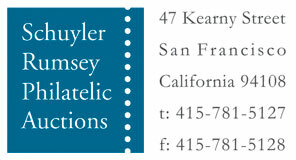 "; silked, fold splitting through signature, Fine. Andrew Jackson, 1767-1845, 7th President of the United States 1829-1837. 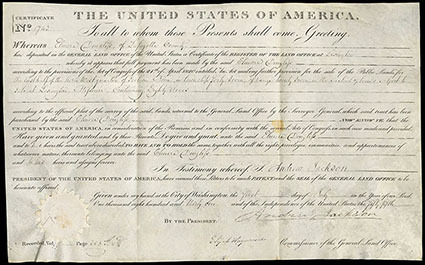 Large signature as President on July 1st 1831 United States General Land Office grant for 80 acres in Lexington Miss., co-signed by Commissioner of General Land Office, embossed seal at bottom left; light file folds and tone spot, Fine signature. 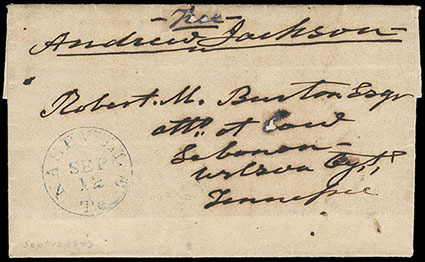 Andrew Jackson, (1767-1845) 7th President of the United States, 1829-1837, old manuscript free frank on undated c. 1843 folded letter sheet to his attorney Robert M. Benton at Lebanon, Tennessee, blue "Nashville, T., Sep 12" cds, no year docketing, some expert reinforcement including small nick at top, still Very Fine. Marquis De Lafayette., French Hero in the Revolutionary War. 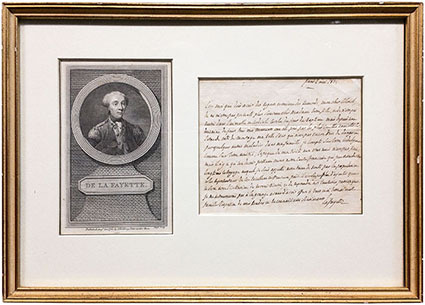 One-page ALS signed "Lafayette", dated Paris 2 May, 1824, in French, framed with portrait engraving of Lafayette in military uniform, Very Fine. 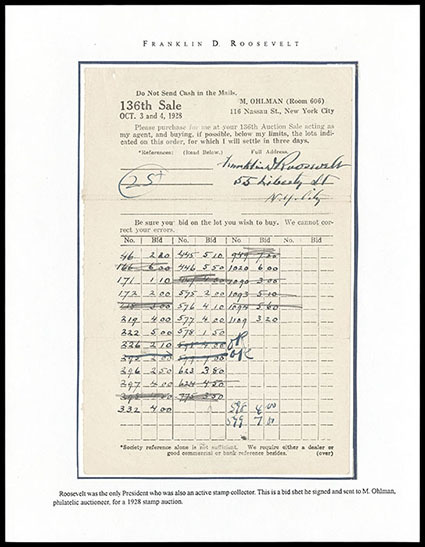 Franklin D. Roosevelt, collection in album including 1928 FDR signed bid sheet for 136th M. Ohlman auction, 1934 signed typed thank you letter on White House stationery for gift of U.S. stamps, a couple items from his stamp collection, couple signed Farley typed letters and some FDCs incl. 770a, 756-765 plate number blocks; 756-765 top imperf plate blocks complete nh, etc., F.-V.F. 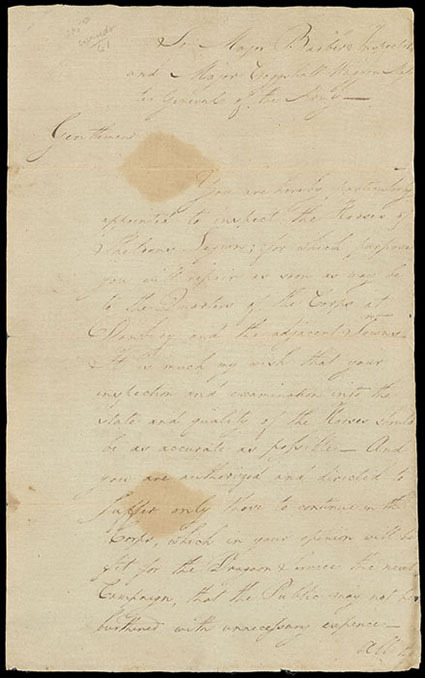 George Washington, ALS letter boldly signed "Go. Washington" as Commanding General of the Continental Army, datelined "Given at Head Quarters, Newburgh, Decr. 29th 1782, Go. Washington", reading "To Major Barber's Inspector, and Major Coggshall Waggon Master General of the Army, Gentlemen, You are hereby particularly appointed to inspect the Horses of Sheldons legion; for which purpose you will repair as soon as may be to the Quarters of the Corps at Danbury and the adjacent Towns. It is much my wish that your inspection and examination into the state and quality of the Horses should be as accurate as possible - And you are authorized and directed to Suffer only those to continue in the Corps, which in your opinion will be fit for the Dragoon Service the next Campaign, that the Public may not be burtherned with unnecessary expence. All others (that is) such as in your opinion will be unfit for that Service, you will discriminate accordingly; and having mustered them out, will cause to be delivered to the Quarter-Master General to be sold, or otherwise disposed of in such manner as he shall think proper. ", and "P.S., After having completed the business committed to you, a Report of your Proceedings is to be given in at Head Quarters. "; couple tone spots, silked for reinforcement and slight edge repairs, Fine. 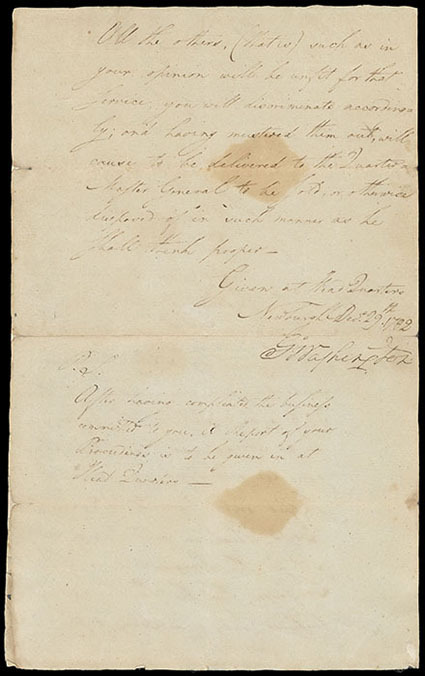 A DESIRABLE REVOLUTIONARY WAR-PERIOD LETTER SIGNED BY GENERAL WASHINGTON AROUND THE TIME OF THE NEWBURG CONSPIRACY. After the British loss at the Siege of Yorktown in October 1781, the American Revolutionary War died down in North America, and peace talks began between British and American diplomats. At this time George Washington and the American Continental Army was based at Newburgh, New York to monitor British-occupied New York City. Around the time of this letter in late December 1782, the so-called "Newburgh Conspiracy" arose. With the end of the war and dissolution of the Continental Army approaching, soldiers who had long been unpaid feared that the Confederation Congress would not meet previous promises concerning back pay and pensions. Congress had in 1780 promised Continental officers a lifetime pension of half their pay when they were discharged. Financier Robert Morris had in early 1782 stopped army pay as a cost-saving measure, arguing that when the war finally ended the arrears would be made up. Throughout 1782 these issues were a regular topic of debate in Congress and in the army camp at Newburgh, and numerous memos and petitions by individual soldiers had failed to significantly affect Congressional debate on the subject. 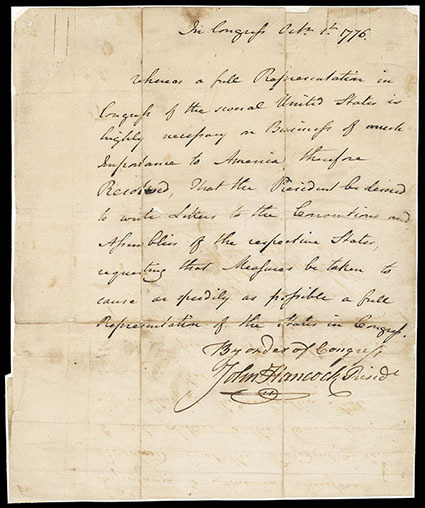 A number of officers organized under the leadership of General Henry Knox and drafted a memorandum to Congress. Signed by enough general officers that it could not be readily dismissed as the work of a few malcontents, the memo was delivered to Congress by a delegation consisting of General Alexander McDougall and Colonels John Brooks and Matthias Ogden in late December 1782. It expressed unhappiness over pay that was months in arrears, and concern over the possibility that the half pay pension would not be forthcoming. In the memo they offered to accept a lump sum payment instead of the lifetime half pay pension. It also contained the vague threat that "any further experiments on their [the army's] patience may have fatal effects." The seriousness of the situation was also communicated to Congress by Secretary at War Benjamin Lincoln.